LMSA conducts a 6-week series of dinghy and small boat races Wednesday evenings during June and July, with races starting around 6:00 pm (pre-race skills and tactics meeting at 5:30 pm). These popular social events are enjoyable for beginners, experienced racers and spectators! Enjoy the races and stay for the parties, complete with pizza, grilling out and great fun for all! All who are age 12 or older, or are qualified Summer Sailing Camp participants, are eligible to race on any sailboat up to 20 feet in length. A Portsmouth rating system is used. Non-LMSA members are subject to a $5 DNR facility user’s fee. 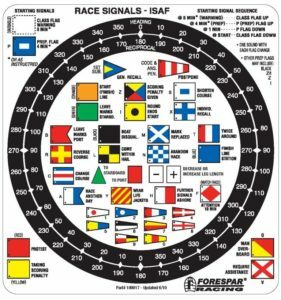 The races are conducted under State of Indiana Boating laws and regulations except for right of way issues which will fall under US Sailing Simplified Right-of-Way Rules and LMSA Racing Rules listed in the 2013 LMSA User’s Guide and Handbook. A limited number of Youth Sailing Program boats are available for rent to LMSA members who hold a valid US Sailing Small Boat Certificate (available through the Youth Sailing Camp Director). Reserve a boat through the LMSA Facility Manager for the $5 rental fee. See the Schedule on our Events Page for dates and times. All LMSA members are invited to participate in the Cruiser Overnighter races. These are Saturday and Sunday races that are more social than serious. Any sailor members can take part, and there are no restrictions on the number of sailors on a boat. The object of the Overnighter Series is to have fun. Prizes are awarded at the end of the season for participation and to the winners of the series. The races are point-to-point, with intervening marks to be rounded. A typical course might begin outside the LMSA buoy field and proceed to Paynetown, Ramp Creek and finish in Moore’s Creek. If the winds permit, the farther mark might be at Fourwinds Marina. After the races, many sailors gather at a lakeside shelter; Hors d’oeuvres are passed around and racers compare notes and enjoy the camaraderie of their fellow sailors. Some participants raft up afterward for a night on the water. A second race is scheduled on Sunday, once the wind has come up. All racers are generally finished by mid-afternoon on Sunday. During 2017, a group of dedicated LMSA members and race enthusiasts brought a new racing series to Indiana, right in our own back yard. We know what a gem the lake is for sailing and those who have been around long enough recall that it was once quite a regional draw for racing as well. 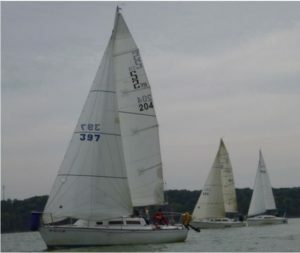 With that in mind, and with the enthusiasm we have seen with our small boat racing program and, of course, the tradition of our Cruiser Overnighters, Lake Monroe Sailing Association is proud to support the Racing Rules of Sailing (RRS) Series. This is an exciting development for LMSA, one we hope will allow us to highlight our beautiful sailing venue and our wonderful association. For more information about the RRS, please download the full announcement and rules. There are six races in the Rules of Racing Series, taking place early in the Spring (May) and in the Autumn (September/October). See the Schedule on our Events Page for dates and times.